Not only humans appreciate the fun that comes with Halloween. At the age of 19, Bengali the rescued Bengal tiger is definitely not a cub anymore - but that's certainly not going to keep him from enjoying the Halloween enrichment he's found in his habitat at Big Cat Rescue. Around this time of year, workers at Big Cat Rescue provide the cats with different cat-friendly toys inspired by the season. ... But he soon find that the toilet-paper mummy makes an excellent wrestling partner. Until, of course, Bengali gets a bit too playful and knocks his toy to the ground. But that's okay! Bengali would rather play with the mummy's severed head anyway. It's much more in the spooky spirit of Halloween, don't you think? 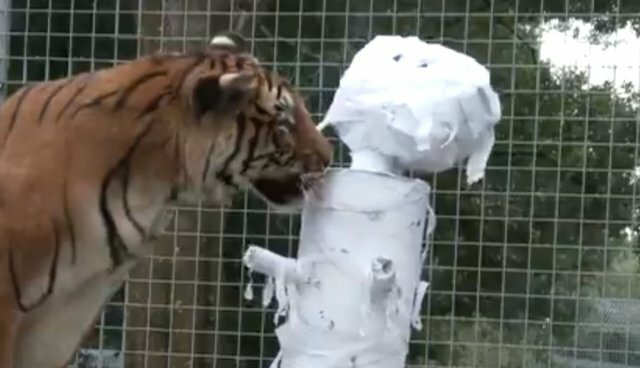 Bengali also tries to get psyched about the pumpkin that he found in his enclosure, but it's just not as intriguing as that wily paper mummy. According to Big Cat Rescue, Bengali was previously in the circus, riding on the back of a horse-drawn chariot, and had a reputation for being aggressive. However, the big cat is now much happier, since he is not spending his days "on the road living in a transport carrier," and can focus instead on much more important tasks - like playing with his favorite red ball.